If we are getting the data from a database , we can always use Where clause in our query to filter the records which are blank or Null and display only rows with values. 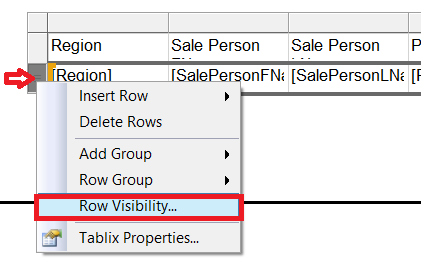 But consider that we don't want to filter the rows by using SQL Query, In SSRS we can write expressions to hide the empty rows. We can use IIF and IsNothing Functions to check if cell value is empty and change the visibility property by using expressions. We need to click on Tablix Detail Row and then go to Row Visibility and then write below expressions. This expression is going to check if Region is blank, and if yes, then it will make the row invisible.